Why You Should Have A Skin Care Routine? September 1st marks the start of Skin Care Awareness Month! Taking care of your skin, the body’s largest organ, with a daily routine is extremely important to your overall health. Skin serves as a protective barrier for your insides, regulates temperature and acts as a filter. Neglecting your skin will make it more difficult to repair the skin. Unhealthy skin costs Americans over $40 Billion a year. Be sure to visit the Skindicator App for a personalized skin care regimen recommendation from Eucerin’s Skin First Dermatologists. Healthy skin is better able to fight signs of aging, heals much faster and defends against potential disease. Therefore, a daily skin care routine is essential. Eucerin would like to share with you some skin care basics to help you achieve glowing beautiful skin. If you’ve ever felt like your skin is a little too tight, it may be a sign that you have not cleansed properly. Whether your skin is dry, oily, or somewhere in between, dermatologists recommend using a mild, non-irritating cleanser rather than a harsh soap. Otherwise, you run the risk of striping your skin’s natural oils, which can lead to overly tight-feeling skin. Moisturizers bind water to the skin so that it doesn’t evaporate as quickly. The right moisturizer can also help bring the right pH balance to your skin and enhance its natural defenses. A product like Eucerin Daily Replenishing Moisturizing Lotion (13.5 oz) provides 24 hour moisturization for healthier-looking, softer skin and is specifically formulated to replenish the skin’s natural moisture barrier. If you’re under a great deal of stress, chances are your skin is too. Stressed-out skin can eventually become thin and less able to regenerate itself. You can help prevent this by taking take time to focus and center yourself every day. This can aid not just your mental health, but the health of your skin and body as well. Finally, the old adage “you are what you eat” is never truer than it is with your skin. For instance, foods with high antioxidant levels, like blackberries, blueberries, strawberries and plums, can help neutralize free radicals that can damage collagen and elastin, the proteins that help maintain skin’s elasticity and tone. Additionally, we want to help you protect their skin and keep it looking healthy – so we’re offering a FREE sample of their Daily Replenishing on Facebook! To receive a sample, click the following here, “like” the Eucerin Facebook Page and follow the instructions. I’m a BIG fan of Baby Aquaphor. I love the Daily Defense Moisturizing Lotion! Thanks for the giveaway! My favorite Eucerin product in the past was their sunscreen. I use the Q10 Anti-Wrinkle Sensitive Skin Lotion everyday and love it. Thanks for the chance to win! I like Eucerin’s Skin Calming Itch Relief Treatment. I don’t have a fav since I’ve havent used Eucerin before, well i think i might have borrowed some hand cream from a friend, but I’m don’t fully remember… but i usually shy away from body lotions because I don’t like a feeling of it after putting on clothes. I love Eucerin Daily Protection Body Lotion. I love how it doesn’t clog my pores! I like the repairing lotion! thanks! Love Eucerin Redness Relief Soothing Night Creme! I aboslutely love Aquaphor from Eucerin. It heals and protects amazingly well. The Daily Defense Moisturizing Lotion is a favorite. I also want to try other products in their line that I haven’t used yet! I love Eucerin! Their products helps my overly dried skin feel baby-soft! I especially love the daily replenishing lotion! I love Eucerin products- they make my overly dry skin feel baby-soft!! I especially love the daily replenishing lotion! Eucerin Smoothing Repair Dry Skin Lotion is my favorite- my skin is dry! My Favorite Eucerin product is Eucerin Daily Replenishing Moisturizing Lotion ! I use and love the Daily Defense Moisturizing Lotion. Thank you for the information and the contest. The calming dry skin body wash is the best! I use Daily Defense Moisturizing Lotion every day. I love the Eucerin Daily Replenishing Moisturizing Lotion it is so soft. Calming Dry Skin Body Wash. I love Eucerin products! My mother used them when I was a child & as an adult I still use them! I use the Daily Replenishing Lotion all the time and love it! Thanks. Their Daily Replenishing Lotion is a staple in our home! I like the Aquaphor Baby Healing Ointment! I love the lotion, it lasts all day. I like the Calming Itch Relief lotion. I love their Intensive Repair lotion! aquaphor healing ointment – everyone in the family uses it. Keep a tube on my desk. Eucerin’s Skin Calming Itch Relief Treatment works wonders for my sons eczema. 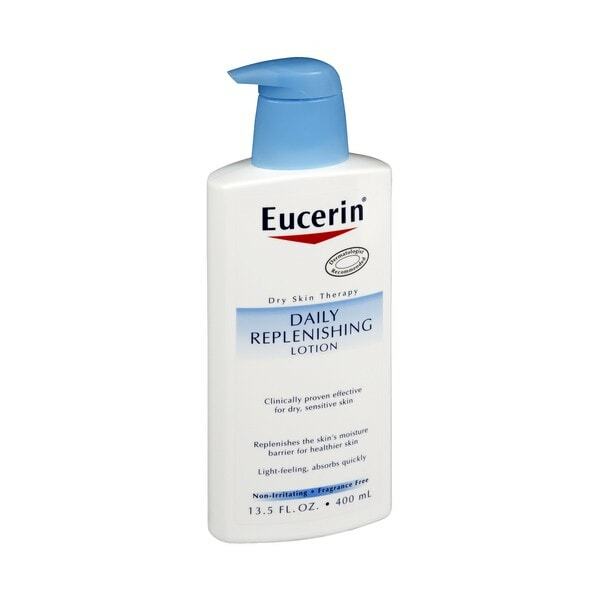 Eucerin Daily Replenishing Moisturizing Lotion. My favorite is Eucerin Daily Replenishing Moisturizing Lotion. Thank you for the giveaway! Eucerin makes excellent products! Would love to win this prize! Please! I like Eucerin Daily Replenishing Moisture Lotion. I use eucerin sunscreen — my dermie recommends it. My favorite Eucerin product is the Eucerin Original Moisturizing Lotion, 16.9 fl oz. Thank you for hosting this giveaway. I love the daily lotion! $100 + Eucerin. Can’t beat that deal! I love the Eucerin Original Creme, it soothes my excezma like nothing else! My favorite is the Eucerin Calming Lotion. My favorite is the Eucerin’s Skin Calming Itch Relief Treatment. I currently use and love the Eucerin Daily Replenishing Moisturizing Lotion. I like Eucerin Skin Calming Itch Relief Treatment. I love Aquaphor. And their calming creme is really nice too. I love my Eucerin Daily Protection face lotion with SPF 30! Mine would be the lotion! I’m a fan of the daily lotion it’s amazing!! My fav Eucerin product is the Daily Replenishing Moisturizing Lotion. I love the daily lotion, it rocks! I don’t currently use Eucerin so I don’t have a fave. I do remember my mom leaving the hospital with a small bottle of their lotion when I was a kid. My favorite is the Calming itch relief treatment. I like Aquaphor Lip Repair. I like the Smoothing repair dry skin lotion. Daily lotion is the best! The Daily Replenishing Moisturizing Lotion is my favorite. Daily moisturizer is an every morning ritual. The smoothing repair lotion is my favorite Eucerin product. I love the original moisturizing lotion….I used it on my pregnancy tummy both times and not one stretch mark! I love the lip repair. I love the daily replenishing lotion. My hands get so dry during the winter and this is the best lotion I’ve found for keeping my hands moisturized and not making then sting when applying it! I love the little tins! i love the every day lotion..i use that more than anything! I also like the lotion! I love the calming creme! Daily moisturizing is a must! Poor people need to moisturize too! Help a sister out. I suffer from dry skin, and I love this stuff so much. The daily protection lotion is a must-have for me. the daily lotion of course! I have been using the moisturizer for years, put on my face under ny make up. I love the calming, itch relief products for both myself and my son. I love EUCERIN products because they reality work, I always recommend to my friends , the EUCERIN products that i use are: AQUAporin active spf 15+uva and the daily lotion. I LOVE YOU PRODUCTS :). I love Eucerin lotion for sensitive skin /rosacea and the daily replenishing lotion is wonderful as well!!! Skincare is very important. Skin is the largest organ in the human body. Thanks for the tips. I only use Eucerin products!! I love the daily replenishing lotion as well as their cremes for sensitive skin/rosacea. I love your lotion. It’s the best out there. The Intensive repair for very dry skin! I love all of their products especially aquaphor! The Daily Replenishing Lotion is wonderful! I love Eucerin products because they made my skin fabulous. I highly recommend this brand for everyone. i love The Daily Replenishing Moisturizing Lotion! I’ve been using Eucerin original forever! Love the stuff! I love the daily replenishing lotion. Wonderful tips & great lotion! Eucerin makes great products. I used them on myself and my children. i love feeling my skin so moisturized! I keep tubs of Aquaphor ointment on my nightstand and next to my chair, so I can apply it everytime I think about it. Eucerin Intensive Repair Lotion is my favorite! cant live without out my eucerin my hands would crack. I dig their Intensive Repair Extra-Enriched Hand Creme. My skin is very dry, I have Sjogren’s Syndrome, so I could actually use this, I need it. My favorite is aquaphor, I put it on my hands every night! I love the replenishing lotion but really I love all of them! I like the Eucerin Intensive Repair lotion! Love eucerin daily lotion it is a must have in my book! Daily Replenishing Moisturizing Lotion is my absolute must have product! I love the Calming lotion. I like the calming cream. The Daily Replenishing Lotion is the best! I love the dry skin relief! I like the daily lotion!! I keep on giving Eucerin a try because I am looking for an intense moisture lotion. My past experieces have been that it is a little greasy and can have a strong smell. I was given Aquaphor Healing Ointment by my doctor to help heal the site of a removed mole and liked that product. The Eucerin calming cream is the ONLY product I have tried that helps my Rosacea & Psoriasis. Thanks so much! I use the creme every single day. I’m a big fan of their face lotion with SPF! I like the Eucerin’s Skin Calming Itch Relief Treatment. alesiars at sbcglobal dot net. I just love all of the lotion! I have never used any of their products. The Daily Protection Face Lotion sounds great though. I love the Eucerin Intensive Repair Very Dry Skin Lotion. It really helps on my elbows and knees which get dry so fast. I love how these products make my skin feel! I know that I’m getting my moisture on the right way with Eucerin! I like the Eucerin Calming Lotion. Fave – Eucerin Daily Replenishing Moisturizing Lotion. I enjoy the lotions. My skin is dry & the lotion helps alot. I like the Itch Relief Creme. It is very soothing. I like the Eucerin Original Healing Soothing Repair Creme and the Eucerin Intensive Repair Extra-Enriched Hand Creme. Sure like to try their lotion sometime & gift card will help w/ the holidays coming up.. I love their skin calming lotion!! I like their hand lotion. I use Eucerin everyday on my son, he has very sensitive skin. I like Eucerin Redness Relief Lotion to calm my Rosacea. It works great! I love the Eucerin Intensive Repair Skin Lotion! I use the Eucerin cream in the jar during dry winter months. I like their daily replenishing lotion. Thanks so much for the fantastic giveaway! Every day is a Eucerin day!! I like the Intensive Repair Very Dry Skin Lotion. Love Eucerin products. They really help keeps my skin soft and youthful looking! I use the daily lotion. I can always use more daily lotion. I think the replenishing moisturizer is the best I have ever tried! I like the Eucerin Smoothing Repair Dry Skin Lotion. Love their Calming Itch Relief! I love the creme, it’s great for my daughters ezcema! I love all Eucerin products!! I actually haven’t tried any of the products, but would love to try the intensive repairs lotion. I like the soothing repair lotion. I like the dry skin lotion. great lotion, GOD BLESS AND KEEP YA’LL SAFE IN HIS LOVING ARMS. Daily Defense Moisturizing Hand Cream. I’ve not tried Eucerin before. I like the Intensive Care Very Dry Skin Lotion. I use the The daily replenishing lotion. I like the Healing Ointment! I like the Aquaphor ointment and have it on hand. I like the daily lotion. My favorite is the Eucerin Redness Relief Lotion. Would love to try the repair lotion! Eucerin Intensive Repair is my favorite. I’ve only tried the lotion – I really liked it! I really like their Daily Defense Moisturizing Hand Creme. I like the Daily Defense Moisturizing Hand Cream. Eucerin is a footsaver. Their Intensive Repair Foot Creme does wonders for my feet. I love the Eucerin Daily Oil Body Wash (excellent for psoriasis, Redness Relief, and their Replenishing Moisturizer (both with 15 SPF and 30 SPF). I have both moisturizers in the different SPFs. If you call the company directly, you can get on their mailing list and receive coupons directly from corporate! I did! Would love to win. Love the Daily Oil Body Wash and Replenishing Moisturizing Lotion. What are you most fav Eucerin products? Leave your email, please. Daily Defense Moisturizing Lotion. I like the intensive healing lotion. I love Eucerin’s intensive repair for my heels and knees! I love their calming cream! My favorite Eucerin product is the Eucerin Redness Relief Daily Perfecting Lotion SPF 15. I love the eucerin original healing soothing repair creme. thank you! Hand lotion, use it daily. My favorite Eucerin product is the Gentle Hydrating Cleanser. The personal sized bottle of Eucerin Soothing Repair Creme is the best! I have never tried it but would like to try the daily defense lotion most. I like the daily moisturizer with spf. I still like their original lotion. It is a company thAT JUST GETS BETTER AND BETTER. I haven’t yet tried Eucerin products so am unsure what my favorite would be, but with my husband’s dry skin I think we’d like to try the Smoothing Repair Dry Skin Lotion. the intensive healing lotion sounds great. I love the eucerin lotion for dry skin! Daily Replenishing Moisturizing Lotion especially since I suffer from very dry skin. I like their intensive repair lotion. I use their foot cream and love it. My feet need lots of care since I live at the beach and am on the sand and in the water almost every day of the year. I like the intensive repair lotion. Love the Original Healing Soothing Repair lotion and the Calming Dry Skin Body Wash! I love Eucerin calming cream. eucering sunscreen — my dermie recommends it. I like the Daily Defense Moisturizing Lotion. Eucerin is okay. I find that for my dry, dry skin, Nivea tends to work better. i just got a sample of lotion in the mail. I really like it. I like the daily moisturizing lotion. I love the Eucerin Intensive Repair Very Dry Skin lotion! I use Q10 Anti-Wrinkle Sensitive Skin Creme daily. I really like the Daily Replenishing Moisturizing Lotion. My favorite eucerin product is their intensive repair lotion for dry skin. I love their lotion! It doesn’t have perfumes which irritate my skin or any other of the strange chemicals I find in other products! I like the super thick eucerin cream that comes in the tub. It’s awesome. I really like the Daily Protection SPF 30 Moisturizing Face Lotion. I like to use the Eucerin Intensive Repair Dry Skin lotion on my hands in the winter. My favorite is the Eucerin Skin Calming Daily Moisterizing Creme. I love the Eucerin Original Healing Soothing Repair Creme. We used it at the hospital where I worked and it did wonder for people. Honestly useful product! I like their daily moisturizing lotion. My dermotologist recommended their Daily Moisturizing lotion when I was in high school and I’ve used it ever since. My favorite is their moisturizers. I like the intense healing lotion. I haven’t tried any, but I see they make a redness relief for rosacea. We would really like to try this. i love the sunscreen for the face! I like their night creme. I have never tried this brand so I do not have a favorite. I hope that is OK!! I am looking forward to trying their skin calming itch relief treatment though! I really like their Daily Defense Moisturizing Lotion. Thanks for having this contest! I love their intense healing lotion. I like the daily moisterizing lotion. Thanks for the giveaway…we like the Eucerin Daily Protection Moisturizing Face Lotion, SPF 30. I love and use the Daily Replenishing Moisturizing Lotion daily! I like their Daily Defense Moisturizing Lotion. Most interested in Smoothing Repair! I love the moisturizing cream! I have super sensitive skin, i break out if i stay in the shower too long and this is the only product that helps me. this is the only product that helps me dry, sensitive skin.